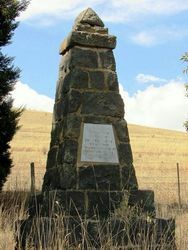 A monument at the foot of Mount Fraser (formerly Mount Bland) commemorates the centenary of the Hume and Hovell Expedition of 1824. The explorers, Hamilton Hume and William Hovell, first climbed Mount Fraser on 14 December 1824, and saw Port Phillip Bay. It was called Mount Bland and Big Hill in the past. At the centenary of Hume and Hovell exploration in 1924 a committee was formed to co-ordinate and organise local celebrations along the route from Albury to Corio Bay. An itinerary was created for for the unveiling ceremonies giving the hour and date for each place concerned from 15 to 21 November 1924. Four more tablets in commemoration of the overland journey to the explorers Hume and Hovell from Sydney: to Corio Bay in November, 1824, were unveiled on Saturday, on a tower at Kilmore, on an obelisk at Broadford, on a cairn at the foot of Mount Bland, and his Excellency the Governor (the Earl of Stradbroke) performed the unveiling ceremony at Kilmore. The tablet on the granite cairn at the foot of Mount Bland bears the following inscription: -"Hume and Hovell Centenary, 1824 -1924. From the top of this mount the explorers first sighted their objective, December 14, 1824."